Issue #005 12/2/09 P90X® NUTRITION ON THE ROAD! Superman wasn't built in 2 weeks. Because the outside world can be cruel for those trying to eat the P90X way, the easiest way to do it is to retreat to the safety of your own kitchen, where you can throw out the junk and stock your shelves with good stuff. Your fridge becomes a safe haven for fresh fruits and veggies. Your freezer stores healthy soups and stews you've made in advance. The bread you reach for is whole grain. The cuts of meat you grill are lean. But what happens when you need to travel, when you need to step outside that kitchen? Sure, a weekend getaway's worth of indulgence won't matter. But what if we're talking about an 18-hour flight followed by a 2-week hotel stay? While you're never going to achieve complete nutritional Zen in these situations, you needn't fall completely off the (organic and locally grown) apple cart. Here are a few tips for maintaining some semblance of the P90X Nutrition Plan when you're on the road. Go for the P90X Portion Plan. There's just no point in trying to whip up an island pork tenderloin salad when you're eating out of a hotel bar fridge without even a hot plate at your disposal. The Portion Plan was designed for flexibility. Just about every section in the P90X nutrition guide has at least one thing you don't have to cook or refrigerate. Create a stash. It's so much easier to avoid succumbing to a Snickers® at the ampm when you have snack packs of raw almonds or a protein bar at your disposal. Beachbody® also sells both Results & Recovery Formula™ and Shakeology® in single-serving packets, so you can always have those on hand too. If you're really averse to all the packaging, get yourself a box of mini-Ziploc® bags and make your own snack packs. Cut yourself some slack. It's brutally hard to follow any kind of diet on the road, so you're not always going to nail it. As Tony says, "Do your best and forget the rest." Check out pages 102 to 103 of the P90X Nutrition Plan for tips on fast food restaurants. A P90X Restaurant Guide. Read "A P90X® Restaurant Guide" in the Related Article section below. Pack a lunch. Most airlines don't serve meals anyway. Furthermore, while it might be a slight pain to schlep it on the plane, you'll finish it before you land, leaving extra space in your carry-on to bring back souvenirs. Water up. You can't bring fluids from home, but once you get past security, all bets are off. Grab yourself a couple bottles of water, or if you want to avoid bottled water, bring your own receptacle and fill it up at the drinking fountain. If you remembered your snack stash (see tip #2), you can pour a pack of Shakeology in one of your bottles so that you have—wait for it—Shakes on a Plane. Special meals. On longer flights, most airlines offer special meals to suit most needs. Some offer low-fat or low-cal options and most offer vegetarian options. Even if meat-free isn't the way you roll, vegetarian meals are often much healthier than their sauce-laden meaty cousins. No nuts for you. It almost seems mandatory to get a drink and a bag of junk food from the refreshment cart when it passes by. Guess what? You can say no—or you can ask for water. Plug it in. A mini-fridge that plugs into your lighter is a great way to keep perishables fresh for several days on the road. Or you can simply bring your beach cooler along and fill it with ice each morning. If the first phase of your journey was a flight, pack an insulated hot/cold bag in your luggage. You can get them cheap at most grocery stores. Albertsons®, not ampm. There was a time when gas station and truck-stop food were the only options on the road, but nowadays you can't throw a stick without hitting an Albertsons, or even a Safeway or Vons. True, you may have to drive an extra 5 minutes off the freeway ramp, but if that's the price you pay to get access to fresh, affordably priced produce and meats, are you seriously going to whine? Bottle your own. There's nothing easier than grabbing a Coke® or Pepsi® at the checkout counter when you're filling up your tank, but you're less inclined to do this if you're not thirsty, so bring plenty of water. Camping stores sell huge multi-gallon tanks meant to fit in your trunk. Plus, if you have your faithful snack stash with you, use the water to Shakeology it up. Rearrange the fridge. You buy your groceries, you check in, you get to your room, and you open your fridge—and it's already filled with junk! Tempting, overpriced junk! Here's the fix. Empty out your grocery bags. If you don't have any, grab a dry-cleaning bag from the closet. Put all the hotel's sodas, mixers, and mixed nuts in the bag and shove it in the closet. Out of sight, out of mind. Fill the fridge with your own healthy goodies. Just remember to return the junk to the fridge before you check out. At most hotels, you can also ask the staff to empty out your fridge when you check in, which can help you avoid unwarranted charges. Upgrade to a kitchen. Hotel suites with full kitchens are fairly common nowadays. Yes, they may be a little pricier, but the money you save from not eating out quickly balances the checkbook. Most experienced travelers depend on three things for a successful trip: planning, ritual, and improvisation. In that sense, it's not that different from a round of P90X. When you look at it that way, merging the two together isn't all that tough. You might trip up during the first few trips, but after that, it'll be easy to find nutritional success inside and outside of your own kitchen. Got something to say? Chat with the writers and other readers this coming Monday, December 7th, at 8:00 PM ET, 5:00 PM PT, in the Beachbody® Chatroom! This 30-minute workout wonder chisels your large back and core muscles. Just 30 seconds per move and nothing fast, but you'll feel it. And your trunk will thank you. Plus sign up today and get a FREE DVD wallet! Turn any doorway into a home gym in minutes! 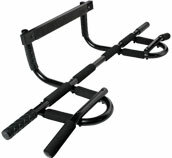 Build and strengthen your shoulders, back, and arms with this high-grade training tool that features 12 grip positions. Missy Costello, Tony Horton's personal chef, got together with a few Beachbody community members to serve up some of the recipes she makes for the P90X creator. What does the top trainer eat to stay in top shape? Click below to watch Missy cook some of Tony's favorite, delicious—and vegetarian!—dishes. You're tougher than you think. The fear of pain or injury from working out is a mindset steeped in failure. You must learn to "find the line." Do the extra rep or two, increase your range of motion, and up the resistance as you get stronger. Intensity goes hand in hand with variety and consistency. And all three factors work as a triad that creates a platform for success. 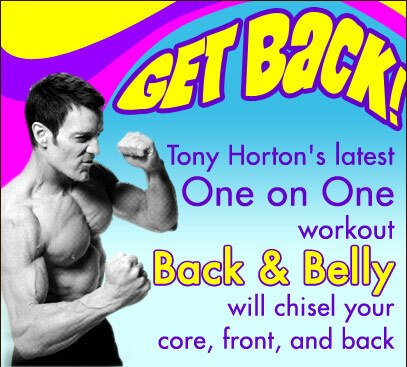 Programs like P90X and 10-Minute Trainer® provide variety. Your plan will keep you consistent. Intensity is the final ingredient that gives you results. For a physiological change to occur, there first needs to be a stimulus. This stimulus comes in the form of an overload. This principle is known as GPO—gradual progressive overload. As you train over time, the overload should be slowly increased. Too much overload too quickly can result in injury. Lack of increased overload over time will result in plateaus. People who plateau often get discouraged and quit. Here are the 3 rules of intensity to help you succeed. Find the line. The "line" is that special place you need to get to if you want any program to work. It's the desire to do the extra reps on push-up day or increase the depth and range of motion of your lunges and squats, and not being afraid to add more weight and resistance as you get stronger. It's discovering your pain/discomfort threshold so you can get the job done without jeopardizing good form and without injuring yourself. If you undertrain or just plain old "give up" because you "can't" do something the first few times, then you'll never know what it's like to be fit and lean. Find the line, do the best you can, and maintain good form. The over/under. You need to understand the difference between undertraining and overtraining. Undertraining is what happens when you keep doing the same thing, with the same weights, at the same intensity, and nothing much is happening. You know you're overtraining when you can't get through workouts without hurling (see "Give yourself a break" in #3 below), and you're so sore for the next 3 days that you can't walk, sit down, or feed yourself. You're training properly when you have some soreness in your muscles—not pain in your joints. Mid-set mini-breaks. Say you're working your biceps and you've mistakenly chosen a weight that's a bit too heavy. You've set a goal of 10 reps, but on rep six, you know you're not going to make it unless you start crossing the line. Stop and hold the weights down by your side for a breath or two (chill! ), and when you're ready, continue to rep 10. You can also put the weights down and grab lighter ones. This technique will work with almost any exercise. This is why I tell you to keep your remote nearby. Think of it as a mini-vacation. Give yourself a break. Far too often I see people trying to be superheroes the first couple of weeks of a program. This aggressive attitude can often cause a phenomenon known as vomiting. To prevent this from happening to you, I recommend NOT trying to "push through it." Superman wasn't built in 2 weeks. He was born on an icy planet and . . . That's another story. Do yourself a favor and kick it down to 80 percent when you're starting out. Illness or injury breaks. If you're getting sick or you're injured, then do the right thing: back off, back down, or modify. Hard exercise when you're injured or ill can be disastrous. You have to think long term. More often than not, taking a break is the smartest approach for your long-term success. "How to Get Ready for the P90X® Experience"
Got something to say? Chat with the writers and other readers this coming Monday, December 7th, at 8:00 PM ET, 5:00 PM PT, in the Beachbody Chatroom! Who needs a panda deep-frying a healthy serving of lean chicken in enough batter and syrupy sauce to make you forget that chicken was ever involved? Instead, try out this simple and delicious high-protein recipe that substitutes flavor for fat, sugar, and salt. Your taste buds—and your waistline—will thank you. Preheat oven to broil. Mix honey, orange juice, cumin, garlic, salt, and pepper. Coat chicken breasts with mixture. Set some mixture aside. Broil chicken about 4 minutes per side, brushing twice with remaining mixture. Makes 4 servings.